Progressives had some fun last week with Frank Luntz, who told the Republican Governors’ Association that he was scared to death of the Occupy movement and recommended language to combat what the movement had achieved. But the progressive critics mostly just laughed, said his language wouldn’t work, and assumed that if Luntz was scared, everything was hunky-dory. Just keep on saying the words Luntz doesn’t like: capitalism, tax the rich, etc. When Luntz says he is “scared to death,” he means that the Republicans who hire him are scared to death and he can profit from that fear by offering them new language. Luntz is clever. Yes, Republicans are scared. But there needs to be a serious discussion of both Luntz’s remarks and the progressive non-response. What has been learned from the brain and cognitive sciences is that words are defined by fixed frames we use in thinking, frames come in hierarchical systems, and political frames are defined in moral terms, where “morality” is very different for conservatives and progressives. What lies behind the Occupy movement is a moral view of democracy: Democracy is about citizens caring about each other and acting responsibly both socially and personally. This requires a robust public empowering and protecting everyone equally. Both private success and personal freedom depend on such a public. Every critique and proposal of the Occupy movement fits this moral view, which happens to be the progressive moral view. What the Occupy movement can’t stand is the opposite “moral” view, that democracy provides the freedom to seek one’s self-interest and ignore what is good for other Americans and others in the world. 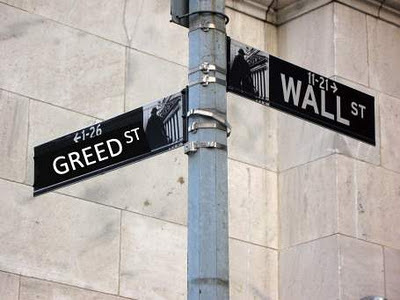 That view lies behind the Wall Street ethic of the Greedy Market, as opposed to a Market for All, a market that should maximize the well-being of most Americans. This view leads to a hierarchical view of society, where success is always deserved and lack of success is moral failure. The rich are the moral, and they not only deserve their wealth, they also deserve the power it brings. This is the view that Luntz is defending. Referring to the rich as “hardworking taxpayers” ignores the fact that a great percentage of the rich do not get their wealth from making things, but rather from investments in other people’s labor, and that most of the 1% are managers, not people who make things or directly provide services. The hardworking taxpayers are the 99%. That is not the frame that Luntz wants activated. But Luntz is not just addressing his remarks to Republicans. He is also looking to take Democrats for suckers. How? By choosing his frames carefully, and getting Democrats to do the opposite of what he tells Republicans. There is a basic truth about framing. If you accept the other guy’s frame, you lose. Take “capitalism.” It arises these days in socialist discourse, and is seen as the opposite of socialism. To attack “capitalism” in this frame is to accept “socialism.” Conservatives are trying to cast progressives, who mostly have businesses or work for businesses or are looking for good business jobs, as socialists. If you take the Luntz bait, you will be sucked into sounding like a socialist. Whatever one thinks of socialism, most Americans falsely identify it with communism, and will reject it out of hand. Luntz would love to get Democrats using the word “tax” in the conservative sense of taking money from the pockets of hardworking folks and wasting it on people who don’t deserve it. Luntz doesn’t want Democrats pointing out how private success depends on public investment — in infrastructure, education, health, transportation, research, economic stability, protections of all sorts, and so on. He doesn’t want progressives talking about “revenue” which is defined in a business frame to mean money needed for any institution to function and flourish. He doesn’t want Democrats talking about the rich paying their fair share for the massive amount they have gotten from prior investments in a robust public. Luntz would love to lure progressives into talking about government “spending” rather than investments in education, health, and infrastructure that will benefit most Americans. He doesn’t want progressives pointing out that corporations govern our lives far more than any government does — and for their profit, not ours. He doesn’t want any discussion of corporate waste, or military waste, which is huge. Luntz would love to have Democrats talking about “entrepreneurs,” which evokes a Republican view of the market as a tool for self-interest. His proposal to discuss “job creators” instead hides the fact that the business community has not been hiring despite record profits. He certainly does not want discussion of outsourcing and minimizing pay for work, which leads corporations to eliminate or downgrade jobs and hence keep wages low when profits are high. Hidden behind his proposal to substitute “careers” for “jobs” is his attempt to appeal to young people just out of college and grad school who expect more — a profession — not just a mere “job.” But of course, corporations are downgrading positions away from professional careers and more toward interchangeable McJobs requiring minimal ability and with minimal pay and benefits. Luntz is right about not saying “sacrifice.” He is right that most Americans are already hurting more than enough. They want a viable present and a future for themselves and their children and grandchildren. He is right to suggest “talking about how ‘we’re all in this together.’ We either succeed together or we fail together.” But that is the opposite of conservative morality. It is the progressive view of a moral democracy that all of Luntz’s conservative framings contradict. It is an attempt at co-opting the progressive moral system, because the Occupy movement is showing that it is an idea of democracy that makes sense to most Americans. And it is an attempt to take Obama’s strongest moral appeal away from him. Let’s lure the right into using OUR frames in public discourse.